Deutsche Bank (DB) replaced its CEO in April and reignited hopes that the bank’s restructuring would soon accelerate and reignite the long-troubled bank. However since then the bank has declined significantly, with a recent S&P downgrade from A- to BBB+ and a relatively weak Q1 2018, amid declines in net revenues and a significant drop in net income. To add icing on the cake, it was also recently revealed that a year ago the Federal Reserve had secretly labeled Deutsche Bank in “troubled condition,” with various oversight measures. 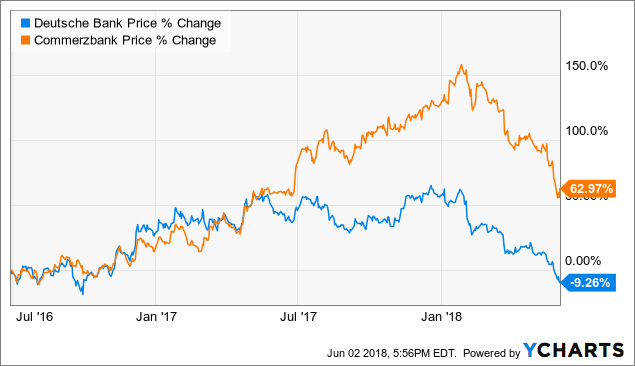 A bank like Wells Fargo (WFC), which has also seen increased Federal Reserve oversight lately, seem to constantly face speed bumps and detours due to regulatory scandals that drags down an otherwise generally upward financial performance. In contrast, it seems Deutsche Bank has faced numerous regulatory incidents that have resulted in slaps on the wrist, but couldn’t cushion the volatile financials of the company nonetheless. 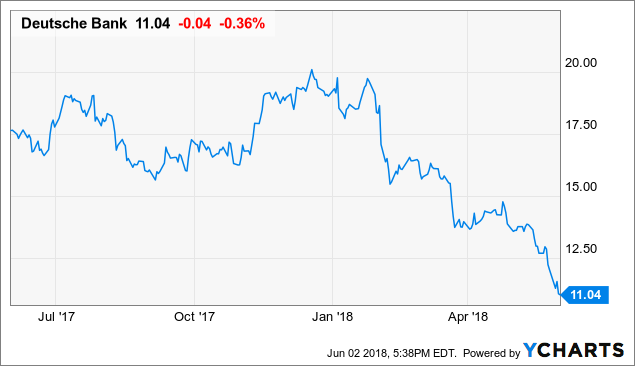 As a result Deutsche Bank has still showed sluggish financials and guidance that now have resulted in its stock hitting an all-time low, below even its levels during the financial crisis or 2016. Nonetheless, I think Deutsche Bank still has hope. The restructuring has had some impact in terms of keeping costs controlled and reducing headcount, with increased impact expected to only manifest itself over the upcoming year. The restructuring aims to be completed by 2020, by which the bank aims to be far more efficient in its investment bank. The upcoming quarter likely will be rough, as Deutsche Bank has both issued generally negative guidance. Furthermore, it expects to cut an additional 7,000 jobs over the quarter, or almost 7% of its current 97,000 workforce. Such a cut during that time will undoubtedly be relatively disruptive to the bank. Deutsche Bank’s market capitalization only stands at a mere $22.8 billion now, far below its historical highs over the past decade. Yet, despite all the gloom and doom, short interest in Deutsche Bank only stands at roughly 2.13% of float and over 34.61% of the stock is still held by institutions. How do we reconcile these seemingly contradictory public reports with “smart money” and market action? The fact is that Deutsche Bank is very unlikely to go out of business, be sold off in pieces, or face any kind of other undignified and financially messy end. The bank is considered extremely systematically important in Europe and retains longstanding lines of business, brand, talent, and potential. Even the European Central Bank and China’s HNA Group, Deutsche Bank’s largest shareholder, have recently expressed confidence in Deutsche Bank’s fundamental financial health. It also should be remembered that Deutsche Bank is not merely one institution among many, as here in the United States where banks are let to fail frequently and often, though the 2008 financial crisis saw a stop-gap to that avalanche. Rather, major banks in Europe (EUFN) are considered national institutions and are carefully cultivated to essentially never die. Though the comparison does not bring warm feelings, let’s even look at Greece (GREK) where the banking system went out of control back during the 2015 debt crisis. Since then, remarkably, the major Greek banks have survived amid continual government intervention and support whenever it seemed they were on the brink of total collapse. Because of this constant nudging, Greece’s banks have now returned to a mild level of stability. As shown by the performance of fellow German mega-bank Commerzbank (OTCPK:CRZBY), the German economy’s (EWG) continued expected strength makes it so that once Deutsche Bank finishes restructuring it likely can capture profit greatly from its still-German focused operations. Even the long-persistent worry for Deutsche Bank, its practice of share dilution, is seemingly less likely. As the bank stops the bleeding and its restructuring moves forward, it likely will avoid the need to raise capital through share dilution. The bank will not not want the negative publicity and investor reaction from dilution, particularly as it tries to show it is really pulling itself up from its situation of the past few years. With Deutsche Bank, even though the institution has had a rough spot over the past few years, it likely will survive and eventually return to a financially profitable level. The only question is how long the restructuring will take and how many years investors will have to wait. I believe it may still be a year before we see enough of a turnaround in Deutsche Bank’s public financials for the market to react. However when it does, Deutsche Bank likely will rally again to a level fitting its sheer size and operating scale. As a stock for the 2-3 year term, I think the company at this level is worth consideration. To me, its current historic lows even look like potentially a unique price point to get in. At Tech Investment Insights I explore a variety of technology-oriented investment opportunities and strategies to help you succeed in this still-vibrant and rapidly shifting market. From ratings of dozens of companies, premium research and analysis, to interviews with industry leaders, it may be worth giving it a try.